This spring I was busy everyday with a brand new experience, division 1 high school baseball. In all my years playing baseball, I would start at third base, bat somewhere in the middle of the lineup, and play the whole game. High School baseball, however, would be something totally new and foreign to me. After breaking my back last year, my initial goal was to make the team where many guys end up being cut. Mission accomplished – but it was bittersweet. Seeing 19 freshman and sophomores on the roster, I knew instantly that playing time would be rough. I had two complete “studs” blocking me at my two positions, first and third. They were older, stronger and simply better and deserved to be played ahead of me. I recognized this and asked coach if I could move to the outfield, but he wanted to keep me where I was to develop me for next year. As it turned out, I would not start this year and barely saw any playing time. I learned how frustrating baseball can be when you are blocked by someone ahead of you. Most importantly, I learned how to work through it with patience, persistence and paying my dues. Patience is vital to a ballplayer to stop frustration from creeping into your head if you are not seeing playing time. An opportunity has to come eventually for you to show what your worth. No one wants to sit the bench, but you can’t sit and pout about it, and for God’s sake don’t have your mom complain to the coach. You must simply understand that the person that is playing instead of you is better and it is not personal. You just have to accept it and pay your dues. This is just another part of mentally handling the game in a way I have not experienced before. Be patient and the time will come for you to prove yourself. It may not be next game or the game after that. It could very well be next year when your shot comes. I know mine is next year because my coach came and shook my hand at the end of the season and said, “Next year will be your year Dave.” While you are paying your dues on the bench take time to observe and learn more about the game. Don’t sit and watch the game aimlessly. Analyze counts to predict the next pitch, understand the situation going on in the field and the possible outcomes so when you do get in a game you’ll know what to do. Patience will pay off if you stay persistent. Once I realized that I wouldn’t be starting, I knew I would have to work extra hard. This means, you go to practice every single day after school and bust your tail. By practicing everyday, I have noticed that I have improved more this year than ever before without playing much. In high school, I have noticed coaches value hustle and heart over anything else. Show your coach how much you love the game by giving it your all. Get there early! Stay late! And work your hardest even when the coach isn’t looking. Always sprint to anywhere you are going on the field. Believe me, your coach will start to notice you more if you persistently hustle and work hard. I could tell my coach saw hustle and heart in me because he took me off to the side multiple times to tell me that I was doing everything right and that he couldn’t get me in because of the stud in front of me who will be on Varsity next year. You can be persistent in the off season by practicing and getting stronger. In addition to playing ball all summer, I signed up to go to a weight lifting and conditioning camp every day this summer to become stronger and be in the best shape I can possibly be in by next year. There is no way I want to be beat out. You need to work harder than your competiton. I hope this time next year I am talking about how I won the starting job, hit dingers, and had a great season. I would then credit my patience, persistence and smile, knowing that I paid my dues. July 1st, 2015 4 Comments	MLB Today	David S.
Above is a philosophy that I strive to apply to myself and challenge others to be open to this concept. “Be humble enough to be coachable,” means that you are not perfect. You need to accept your flaws. Once you understand that you aren’t perfect, you can be open to constructive criticism. First, you must throw your ego out the door! Next, let someone help and improve your game. I don’t care who you are, this applies to players from little league to the pros. Coaches will be able to actually coach you and help you, and ultimately your team. It will not only help you improve your game, but demonstrates character to your coaches and others. We all know “that one kid/player!” Before a practice even starts, you can often tell who the difficult diva, uncoachable kids are, especially when the coach is talking. They aren’t making eye contact. Usually they roll their eyes, and make some wise crack comment, thinking that none of this coaching/guidance applies to them, because they are so awesome. They drag their feet if they don’t get to play “their” position . They usually never stick around to help clean up after practice and scream “unfair” when not selected for an All Star team – because after all, they are so awesome….. Well this behavior shows lack of good character. When a coach coaches you, you have to understand that it is not an insult to you personally, as so many take it. No matter how good you are, there is always some way to improve, whether its your swing, your fielding, your speed, or your IQ – there’s always room for improvement. I have seen time and time again teammates of mine with a boatload of natural talent, but they aren’t coachable. The natural gift is there, but they will never reach their potential. They seem to peak by high school and then when they enter a “big pond” of competition, they become a “small fish” and don’t excel. Being coachable takes practice, start early and show your coach respect for their help and knowledge. If you are not the most talented one on the team, but have good character, practice hard, and listen to coaching, it will show. Coaches will view you more positively and take you more seriously than the “stud” with poor character. So check your ego at the door, let your coach help you, and be a good team mate. 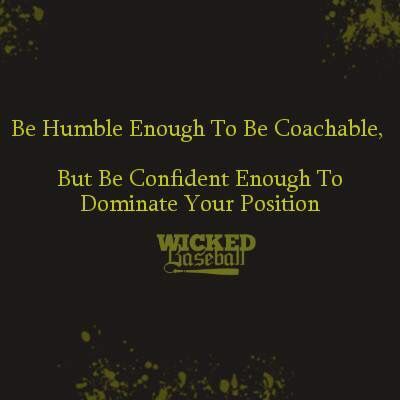 “But be confident enough to dominate your position.” Once you are out in the field, have confidence in your abilities. It means to be able to tell yourself, “I can and will do this!” It’s the time when you need to put faith in your training and skills without thinking you are above others. If you are not confident at your position, it shows, and success may elude you. Baseball is a mental game. Being confident, not cocky, can give you a little edge over the competition. When you think that you are better then everyone and then that error is made, mentally, you come crashing down since you think you are so great and are not supposed to make mistakes. Or….you blame others. Coaches and scouts are very aware of, and appreciate the player that recovers after an error rather than crumbles. That player is humble, confident, and makes corrections. As I wrote in a previous article, baseball is a game of failure and the mental side is crucial, it applies here as well. Click HERE to read that article. Once you believe, you will achieve…Do I get points for that corny cliché? It truly applies. Remember, lose the ego to have others help you improve, but have confidence in yourself when the opportunities on the field come! January 3rd, 2015 4 Comments	MLB Today, Philosophy	David S.